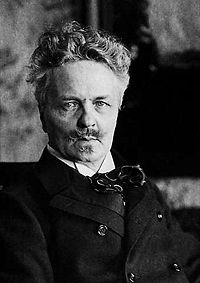 In our ongoing search for potential story ideas that can be turned into short films, Robert is back collaborating with Colin Cameron, this time on a short film featuring Colin as the 19th century Swedish playwright, novelist, and essayist--August Strindberg. Colin is a Strindberg buff and has an idea for a short mockumentary film script. The piece takes place in 1910, two years before the famous playwright passed away. Robert in turn has added his own modern twist to the tale. We will have our first story meeting in the next couple of days.